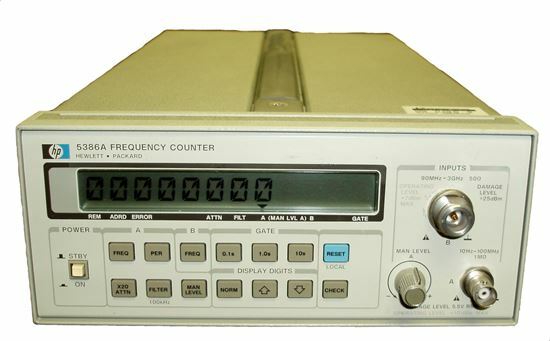 The Agilent/HP 5386A Frequency Counter offers prescaled measurements to 3 GHz based on gallium arsenide (GaAs) technology. The GaAs prescaler and attenuator circuitry are integrated on a hybrid substrate. Bipolar technology permits the integration of reciprocal counting and interpolation techniques on a single integrated circuit. The tightly-integrated design achieves overall high performance, excellent reliability, and low cost of ownership. The 5386A incorporates a 12-character display, accessible remotely via HP-IB. The liquid crystal display (LCD) can be read in direct sunlight, and has large characters that can be seen from the end of a bench or mounted high in a test rack. The 5386A can be easily carried to remote locations for service and calibration applications. Controlled via HP-IB, the display can be used for messages and operator prompts, or even blanked for security. Measurements are displayed in your choice of units. The number of digits displayed can be varied from the front panel or HP-IB.